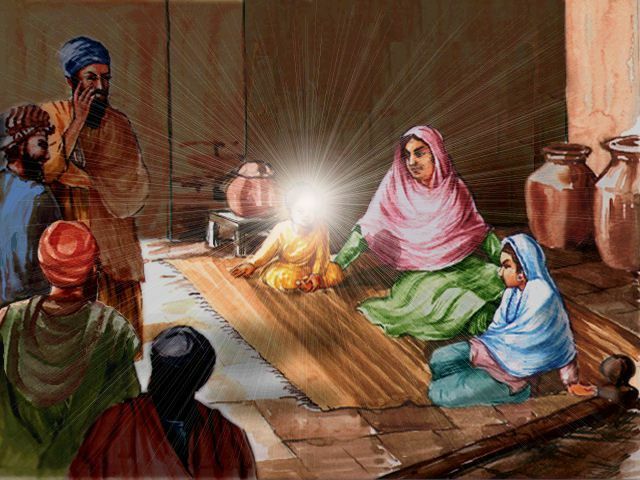 All who beheld Guru Nanak as an infant felt drawn towards him. Resting in his cradle, or lying in the loving arms of his kith and kin, the infant would ever smile such a beaming smile that all who saw him felt an unknown joy stealing into their hearts and elating their souls. He never cried but ever smiled and played. When he was able to walk, the same jubilance marked him wherever he went, Soon, another trait of his personality became visible. Whenever a beggar, a needy man, or a faqir, called at the door, he would run in, take hold of whatever article of food or clothing he could get at, and, with a beaming, compassionate face, deliver it into the hands of the mendicant. Little did his father relish such unbounded charity but what could he do? In this way, this child who had come from the Lord became three years old. Now he started talking. He started playing also but his playing was somewhat different. When the sister would talk or tell some small stories, then he would listen and while listening he would say: Yes, He is there. Yes, He is there. Sometimes he would say: See! Who is there? It is He. It is He! Then he would raise his hands and say: It is He. It is He! In this way while playing, in a playful gesture he would say something that people in the house did not understand. Sometimes in the verandah or his mom's room he would sit down with legs crossed and close his eyes. Then open his eyes after sometime and laughingly say: Yes. 0 Lord! When another child came to his house, Guru Nanak would offer them bread to eat and give butter. The toys that his mother would bring or the playthings that his sister gave, Guru Nanak would give them away to other children. Like other children he would not say mine, mine, or cling to the toys. At the early age of five, he began to talk of divine things. When he was among his playmates, he would, at times, seat them all around himself and bid them repeat after him the name of the Formless Lord. At other times, he would run and jump, frisk and gambol, at the bead of his little band. When all alone, he would sometimes sit for hours with half-shut eyes. Those who beheld him thus occupied, were struck at the radiance and glory that emanated from his calm, rosy face. 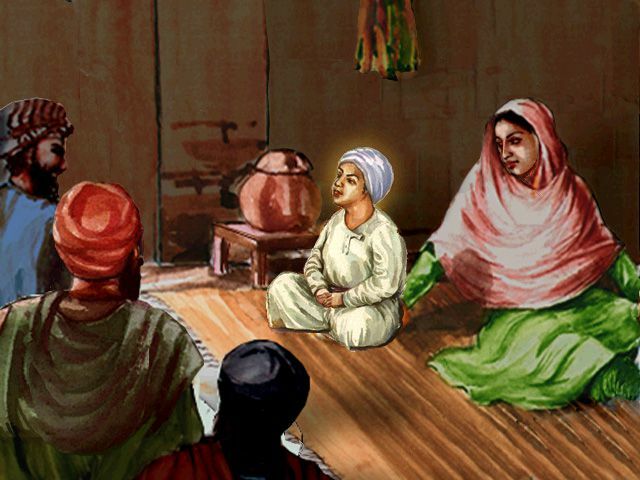 Guru Nanak was not an ordinary child. Children of his age liked him very much and everyone wanted to play with him. Nanak's games were different from other children. He was a child of smiles, and his eyes were silent and wise. Whoever saw the child, or touched him accidentally, praised God. A thrill of unknown delight came to anyone who lifted the child, played with him. Everyone saw that he was a child of God, he was beautiful, mysteriously fair in colour and form with a radiance that was new to earth. At a young age he used to talk about the Supreme Soul, the path of religion and good deeds. Guru Nanak loved to play with the children of his age, he would share all his things with them. He was also gifted with a sweet and melodius voice. He sang in praise of God and his friends would repeat after him. The villagers were always pleased to hear Guru Nanak's melodies. Nanak cast a spell none escape. One day the head of the village Rai Bullar heard Guru Nanak singing. He was so impressed he mentioned to his friends that "Nanak is not an ordinary child. He has come into this world to steer people onto the right path." 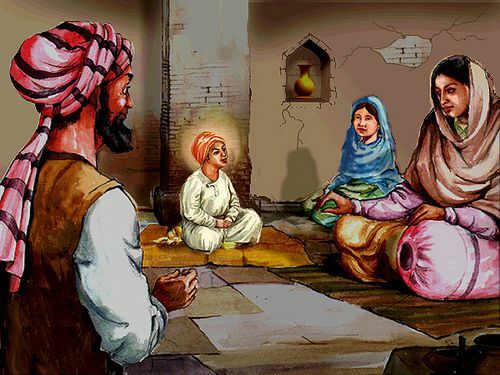 When Rai Bullar and his friends passed Nanak, Guru Ji stood up and paid his respects to Rai Bullar. The Guru spoke with such dignity and wisdom that Rai Bullar and his friends were surprised to the hear the words from a child of such young age. Gurdwara Sri Bal Lila Sahib marks the field where Guru Nanak used to play in the company of other children.